I went to Austin over the weekend for a writer's conference. We got there Thursday night, which gave us all day Friday to explore. I mentioned to the hubby's relatives (who we were staying with) that I was interested in visiting the city's best tea rooms, and we were off. After one disappointing stop at Momoko, a Tokoyopop memorabelia store where you are supposed to be able to get the best bubble tea in town but which was closed when we stopped by, we had a great time. We went to the Tea Embassy, which is more about loose tea and merchandise than prepared tea or a food menu (although they have special tastings one weekend each month -- we just went on the wrong weekend) . It's housed in a historic building on Rio Grande steet. They have several teas available for free sampling. 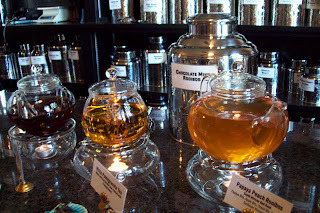 When we went, there was a peach flavored red rooibos, which was amazing. They also were offering samples of Thai tea. 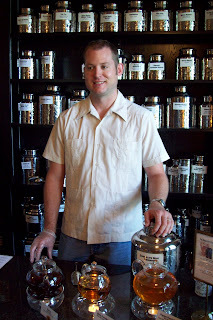 I bought a very nice chocolate mint rooibos from the very knowledgable Jake (pictured below). 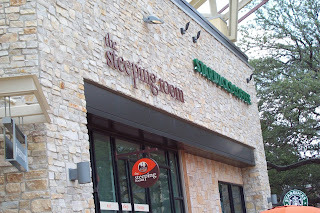 From there, we went to the Steeping Room, which was very up-scale and offered a full restaurant menu. Note that in the picture, it is right next door to a Starbucks, which I find a bit ironic. They had a whole wall of loose teas. 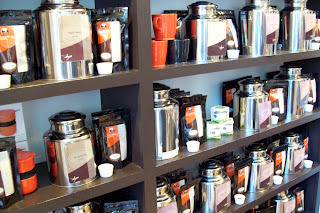 I liked the way each had an open sample cup so that you could look at the quality of the leaves and smell the blend. I bought what turned out to be a very light strawberry green tea, which had large chunks of dried strawberries mixed with the leaves. The guy at the counter mentioned that that was one of the day's featured iced teas, but I couldn't bring myself to pay $2.50 for one iced cup of the brew when I'd just bought 2 oz. dry.